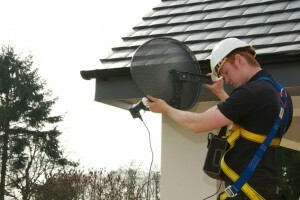 Digital Direct are local FreeSat dish installers for better No-Contract FreeSat TV Reception. Over 240 channels including 13 HD channels. Sky Satellite installations may be one option but some of these users may not want to commit to a Sky contract. Today there is also the contract-free FreeSat that provides over 240 channels of digital TV & radio, with 13 free HD TV Channels, from the BBC, ITV, Channel Four, 5 HD etc. for a one-off installation charge. High definition (HD) gives you up to 5x the picture detail of standard TV giving richer, deeper, more life-like pictures, with stunning surround-sound putting you at the centre of the action. Your HD service is free on FreeSat, so you may watch HD programmes from the BBC’s 6 HD channels, ITV, Channel Four, 5 HD etc..
You will need a freesat HD digital box connected to an HD Ready TV, or a TV with HD FreeSat already built in. Digital Direct’s Freesat Installers can advise you on your best HD options. 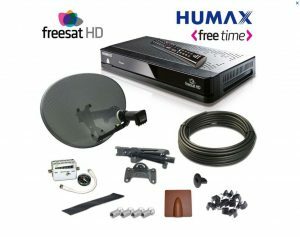 Freesat+ Box. With a freesat+, HD digital television recorder, you can record, pause and rewind live TV. On-screen guide to programmes. This 8-day guide makes it easy to choose what to watch, at the press of a button. Free HD content from the BBC & ITV. No contracts just a one off installation fee. Ask for your free digital test and quote. Freesat Installations receive broadcasts from the same fleet of satellites as Sky Digital: Astra 2A, Astra 2B, Astra 2D & Eurobird 1.